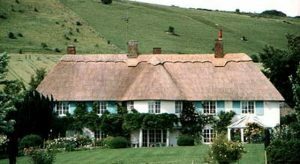 Until the 1960s most of England’s thatched buildings were covered with straw. The evidence surviving within historic roofs indicates that the vast majority of roofs in England were thatched with wheat straw, which was abundant and available cheaply as a by-product of grain production. Rye straw was once widely used in the West Country and in other areas less suitable for growing wheat, but was largely abandoned as a crop in the early 19th century. Most of the straw used over the past two centuries could be described as either ‘combed wheat reed’ or ‘long straw’, although there were many local variations. In the West Country, wheat was carefully grown, harvested, threshed and ‘combed’ to remove grain, leaves, weeds and short or broken straw without crushing the stem, producing ‘combed wheat reed’ (also called ‘Devon reed’ or ‘wheat reed’). This material shed water efficiently and dried out quickly after being wetted, and good quality wheat reed could perform well for 40 years or more when applied by a skilled thatcher. Combed wheat reed spread beyond the West Country in the 1960s and 1970s, and is now commonly used throughout England. However, prior to the spread of this technique, outside the West Country, wheat straw that had been crushed by the flail or the drum of a threshing machine was carefully cleaned and re-formed into a long-lived thatching material called ‘long straw’. Water reed is used extensively in parts of the West Country and East Anglia. New properties are almost always thatched in water reed since it is the most durable of the thatching materials, and tends to give the longest life. 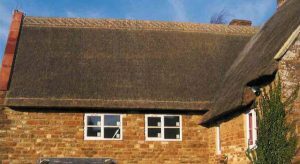 Many factors influence the longevity of a thatched roof and it is therefore unwise to generalise on the subject. However a Norfolk Reed roof situated in one of the counties of East Anglia where there is a tradition of very steep pitches, could be expected to last an average of 50-60 years although there are instances of roofs lasting much longer than this. 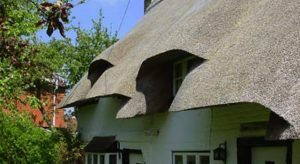 When re-thatching with water reed, the existing material will be completely removed back to the roof timbers, although in the south-west of the country, where roof pitches tend to be less steeply pitched, thatchers often lay water reed on top of a base coat. The new reed is carried on to the roof in bunches and, starting at eaves level, is fixed directly into the rafters with the butts of the stalks exposed. Each layer of reed is held in place with either steel or hazel sways and once in position it is dressed into shape with the use of a legged. The best quality thatching straw is grown from older wheat varieties that produce tall, strong-stemmed straw without the use of artificial fertilisers. Excessive nitrogen, whether artificial or organic, encourages stem growth which weakens the stem walls and reduces its durability when used as thatch. Older wheat varieties, some of which have been grown specifically for thatching for almost a century, will simply grow very tall and fall over if they are grown in fertile soil. The crop is cut before the stems have fully ripened, unlike conventional grain crops which are combine harvested when the field is ‘dead ripe’. If the crop is left to ripen fully, the stems will ‘lignify’ and become brittle, and the straw will be unsuitable for use as thatch. The crop is cut with a reaper-binder, which ties the straw into bundles that are ‘stooked’ in the field to dry for 10-14 days. Many growers prefer to store the dry straw in a barn or rick for several months to ‘season’ it before threshing, whereas others thresh directly from the field. To produce long straw, the bundles are fed into the drum of a threshing machine, which strips the grain from the ears while leaving the straw bruised, but largely intact. In contrast, combed wheat reed is fed into a comber attachment which sits over the drum of the threshing machine, strips the grain and leaves, and combs out short and broken straw and weeds, without crushing the straw.